Today, Citi Bike officials debuted a new fleet (200 to start) of pedal-assist electric bicycles. Back in April, Mayor de Blasio backed off from cracking down on all e-bikes, which had drawn safety complaints from some residents. E-bikes have been technically forbidden since, though scofflaws are legion. But on [April 3], de Blasio reversed, instructing his Department of Transportation to loosen its ban and recognize “pedal assist” bikes — or bikes that use a rechargeable battery to boost their speeds — as a legal means of getting around the city. Any e-bikes with a motor capable of pushing its speed above 20 miles per hour, however, will remain effectively banned. “With new and clear guidelines, cyclists, delivery workers and businesses alike will now understand exactly what devices are allowed,” the mayor said in a statement. Transit advocates have pointed out that e-bikes are an increasingly popular mode of transportation in cities worldwide, including Paris, Madrid and Lisbon. As Streetsblog noted, the city is maintaining the ban on the cheaper, throttle-controlled e-bikes that most delivery workers use. Does one need a driver's license to operate one? Now every bicycle delivery guy will be zooming all over the neighborhood on these things, especially since the Cops 👮‍♀️ can’t confiscate them. Thanks DeBlasio! To be fair, at least ShCitibike had the sense to make sure those bikes don't exceed over 20 mph. The majority of these bikes can go at least 25-30. The other thing that should be mentioned is the motorized skateboard problem going on, but like I said, since rich assholes use them they will be ignored by the cops. You are absolutely correct about ShCitibikers, they ride like retards and are always running reds and running up on bikers too like they are in the Tour de France. Now that the city has the whole Manual Bicycling thin under control this is an even more brilliant idea! A few months back there was a crack down on electric bikes the city said they were illegal to operate. Now they have electric citibikes? What happens to those who got their bikes confiscated in the crack down? What about those fines? I wish the city would install speed bumps in bike lanes to keep bicyclist to a decent (slower) speed. The cardio temptation is just to strong for some people to resist and the dopamine rush makes them feel indestructible. I really can't believe what a bunch of cranks comment on this site. Citibikes are great. There needs to be more of them. Without them, the only way across town is the L train or M8. The M8 is slow and L train is packed (and stopping in 2019). I don't know why we need electric ones though. Part of what's nice about them is the exercise. Anon 9:19Am Maybe cause we are SCARED SHITLESS of how RECKLESS THE BICYCLISTS ARE to OUR HEALTH and WELLBEING? If electric bikes enable a wider range of food deliveries, I'm all for them. You already have to be very aware of regular bikers barreling through red lights etc, so I don't see any difference. @9:02am: Agree about installing speed bumps - it can only help. I'm terrified of the upcoming carnage that this will unleash, esp. since the oh-so-entitled bike riders are SURE they're angels on earth, and the pedestrians can go rot. Every time I think De Blasio can't get worse or do anything dumber, he proves me wrong. @Anon 9:59 AM - I commute to work on my own bike every day. Sure, there are some dickhead bike riders, but they are far outnumbered by all the witless pedestrian morons that wander into bike lanes and through intersections against the right of way, often too focused on their phones to pay attention to what's happening around them. If you're one of those people and you get scared shitless because you're oblivious to what is going on around you until a cyclist is upon you, TFB. Everyone needs to pay attention to the right-of-way - pedestrians and cyclists alike. If you actually are paying attention, it's hard to believe you'd end up so startled in the first place. 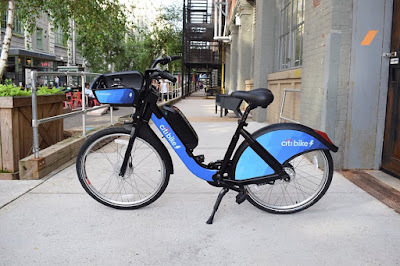 And FWIW, I'm not a fan of electric citi bikes...these things are already like U-Hauls and Zip Cars...you never know if the operator has any business being out on the road in the first place. Making it electric will probably only expedite some of that cluelessness, but life goes on. Just another obstacle to avoid in the urban jungle. The main issue here is safety, both for cyclist and pedestrians. Putting these electric bikes on the street without any training for riders is a recipe for disaster. The city’s ongoing electric bike crackdown was for a very good reason: the bikes are faster, heavier, and silent, which means that E-bike accidents are more serious, both for the cyclist and the pedestrian. For some reason the E-bike delivery guys almost never seem to have front or rear lights on at night or even a bell or horn to warn people they are coming. Now that DeBlasio wants CitiBike to have pedal assisted bikes it seems those safety issues have gone out the window. The Netherlands has some of the most experienced cyclists on earth, and they are seeing the negative effects of electric bikes. Only 6% of victims of a regular cycling accident end up in and ICU, while 20% victims of electric bike crashes end up in intensive care. The e-bikes are also popular with older riders, who have more balance problems and slower reaction times. When an older rider crashes their injuries are more serious and they are the ones most likely to die. As for the speed issue, 18MPH is faster than the average car speed in Manhattan, and is faster than the speed of most regular cyclists. Now add in all those “witless pedestrian morons” texting while crossing the street and lets see how much longer CitiBike’s clean zero fatality record lasts. Based on what we are seeing in other countries who are using E-bikes including the Netherlands and China, my guess is that it won’t last very long at all. Fortunately, those cyclists that are sure they're angels on earth can get to heaven that much faster on the e-bikes, if you catch my drift.